A lively debate began over the vampire, ghast and unidentified companion in the crypt, now perhaps sealed up by two heavy stone doors stacked on top of the trap door. Could the party take on a vampire? The consensus was no, they could not. Could the vampire escape? Probably. After all, vampires are unusually strong. The party dug deeply within their imagination, even considering the strength of a vampire compared to a man imbued with the strength of a spider. In the end, they decided to hope the heavy doors kept the vampire in while they returned to old man in the tower. 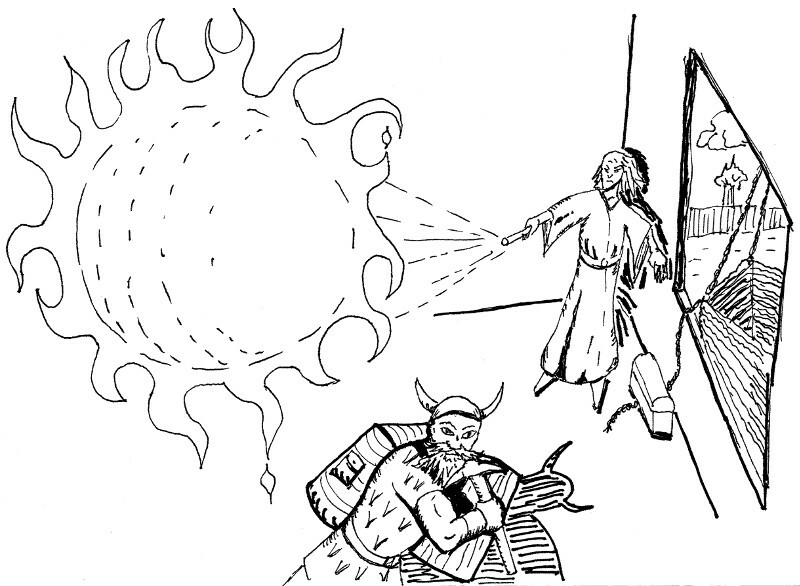 Galyn and Tienarth recounted how the old man at first appeared to be a confused zombie and then changed appearance to that of a kindly wizard. They told Ghevont and Azrak how they killed many zombies and a wraith. Ghevont was skeptical. As they approached the crumbling manor, they noted the unusual site of a large basket hanging from a larger balloon, a rope tethering the basket to the tower and a small fire burning in a brass dish suspended below the balloon. The party re-entered the house and climbed to the top level where the old man greeted them. After momentary confusion, he explained that he was making preparations to ascend to the moon. He ordered them to release his pet stirges, an order quickly completed by Galyn. The stirgies fluttered around the room and out the window. “And now, I will add a bit more flame to my device,” the old man announced, waving his wand. Suddenly, a fireball erupted in the room. Flames washed over Ferris who promptly fell over dead. Likewise, Tienarth’s skin seemed scorched. He complained of burning. The others dodged the fire and felt unhurt. Meanwhile, the old man climbed into the basket. Azrak whipped out his heavy crossbow and fired a bolt into the back of the old man who shrieked in pain. Tienarth gathered his wits and delivered a lightning bolt that made the hair on the old man’s head stand straight up before he crumpled into a heap in the basket. The stirges reacted by swarming back into the room. One sunk his needle nose into the unconscious Ferris and began slurping blood. Another lodged into Tienarth. Galyn stepped over to the lifeless Ferris and struck a glancing blow on the stirge that failed to dislodge it. Ghevont ripped the stirge free. Tienarth let loose a sleep spell and all but one of the stirges dropped to the floor. This last stirge retreated into the sky. Vilmar bent over Ferris to administer healing magic and declared him unhurt. Galyn slapped the thief’s face to draw him out of stupor. “It’s an illusion!” declared Ghevont, who then climbed into the basket hanging from the balloon. He rifled through the old man’s belongings, producing the wand, a ruby ring and a set of keys. Presently, they fit the keys to four pairs of manacles. Azrak stowed these and the keys in his capacious backpack as the party marvelled at how he avoided tipping over from the extreme weight carried on his back. Ghevont handed the wand to Tienarth then examined the ring. It was a silver ring decorated with a bat clutching a large ruby. He stuffed it in a pocket. Azrak and Vilmar carefully folded up the legs of the tripod supporting the heavy brass telescope and affixed it to Azrak’s second horse. Meanwhile, Ghevont cut the basket free. He watched the balloon carrying the basket and the dead wizard drift into the sky towards the horizon. A quick search turned up no other treasure, and Tienarth decided against employing his wand of treasure-finding. With that, the party agreed to return to St. Orlan. Ghevont’s idea was to donate the telescope to the city militia. A party vote forced him to demand payment from the guards who had no funds. On the advice of the guards, they asked the sheriff who immediately recognized the dwarf who tried to import a goblin slave weeks before. Little cooperation was offered, and the party decided to sell the telescope in Slateholm. They were also eager to identify and sell other items. Still, they lingered in St. Orlan for a week or more, selling a few mundane treasures such as jewelry. Azrak found a local warrior to provide instruction in fighting techniques. After this time of training, they made an uneventful trip to Lah’s Retreat where Lah pronounced a judgement with regard to the headdress of Ghot that Galyn had become accustomed to wearing. Lah decreed that items are not typically evil, though this one clearly celebrated a profane being. The church would make no prohibition against the headdress, but there was no accounting for the reaction of any person. Salvation and damnation are private affairs. Ghevont judged this as a mild dressing down of the junior cleric, Galyn, who remained unmoved and resolved to continue to wear the gaudy headdress. The utility of a continual ability to read language both magical and mundane outweighed any potential complications. Ghevont inquired with Lah about the vampire, and Lah reminded him of the sacred oath of all clerics to annihilate the undead. Yet, Ghevont wondered if Tienarth’s Raiders were a match for the task of clearing out a vampire lair. On this topic Lah promised to pray and return an answer later. They rode onward to busy Slateholm to visit Benabil. 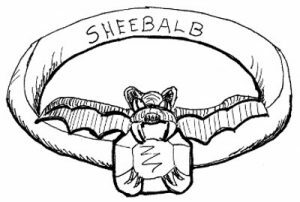 They they paid to identify the ruby ring as a protective device crafted by the ancient cult of Sheebalb, an evil bat god. Now Ghevont’s protestations against Galyn’s headdress were balanced against the utility of a an equally profane magical device, and he contemplated whether the good he might do with the ring versus the damage done to his soul. The staff removed from the crypt was revealed to be one of healing, a tangible focus for the same healing magic doled out by clerics. The staff was the length of two arms and engraved with archaic symbols celebrating St. Antolin, an early church father now all but forgotten. Ghevont packed this away for future use. The bone wand taken from the old man was now known to produce illusions. Benabil remarked on it’s unique design, its command word hinting at the crocodile’s bone from which it was carved: fibula. 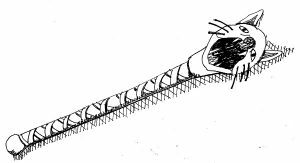 He called it the Zombraire’s Wand, the name being mostly inspiration devoid of further explanation. Finally, Benabil recoiled as Ferris unwrapped the shortsword found near the well at the old manor. “A wicked blade, that is,” he declared, “Its dark iron strikes deadly on the flesh of elves and faery folk!” It was an evil blade, surely lusted after by any goblin or orc. Their business concluded, they made way to the adventurer’s guild hall. Once again, we experienced our youngest player bonking after two hours, which left everyone else craving more action. Yet with Nick and Jeff having left, the other three players didn’t want to dive into another adventure without them. Next session I’m going to take some inspiration from NASCAR and schedule a yellow flag partway into the session. I hope that will have the dual effects of having an upcoming treat to focus the first half and a refueling for the second half. An interesting question raised and unanswered: is it wrong to fly up into the sky to visit the moon? The Anointed One and some saints were known to have ascended into the sky and to heaven. Another question: how does one recharge a wand? Probably by memorizing the spell matching the one fired by the wand and putting the spell into wand instead. Consequently, the magic user who might charge a wand must know the spell.